Becoming a Center member is a great way to connect with others who are passionate about plain language. You’ll also receive special member pricing on workshops and events, and award nomination fees. Already a member? Sign in to view your profile or renew. 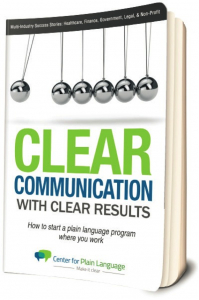 Our eBook can help you jump start your plain language efforts. Our Credit Card Policy: All credit card transactions are final.